Is there any way that Select by luminosity of Layer can be recorded in a macro. E.g. 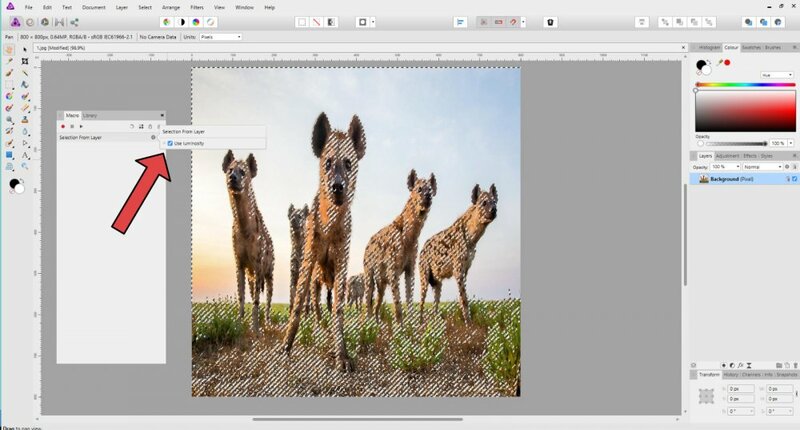 Ctrl, Shift an left clicking the layer gives you a selection based on luminosity (the brightest pixels) However if you try to record this as a part of a macro you get a warning that states layer selections cannot be recorded as macro. Basically, we should be able to record every action we do in a macro as in Photoshop. Come on Serif this is a basic requirement. I agree. It is even more important considering the programs have no proper scripting support. Carl123 if you press and hold down shift and ctrl then whilst still holding those keys down, left click a layer. This should make a selection based on luminosity. However if you try to record that step as part of a macro then AP does not allow you to do that.You get a warning stating that layer selections cannot be recored in macro. Hope that makes sense, thanks for any help you can offer. Sorry if i confused you, i have updated my original post to make it more clear. When replayed the macro will now make a selection based on luminosity. Thank you Carl that has helped a lot, but it would be better if a. AP let us record macros just using shortcuts and b. the actual effect is displayed as you are recording macros. Your workaround is much appreciated but without the one click facility, it is not really a conducive work flow. Oh well still early days for AP but a great app non the less. I will see if i can crack on with this macro and let you know how i get on. On a side note, another thing AP macro recorder does not like is changing names on spare channels. EG if i create a selection and save it to a spare channel : spare channel Select/Save selection/save selection as spare channel then the macro is ok to that point. if i then try to change the name of that new spare channel i get the message macro cannot record etc.